I love cheese. One of the best ways to enjoy it is via a grilled cheese sandwich (GCS). As a kid, I used to come home from school and eat a GCS or two as my “snack”. It was also one of the first dishes I learned to make – margarine, 2 pieces of wheat bread and a Kraft Single. 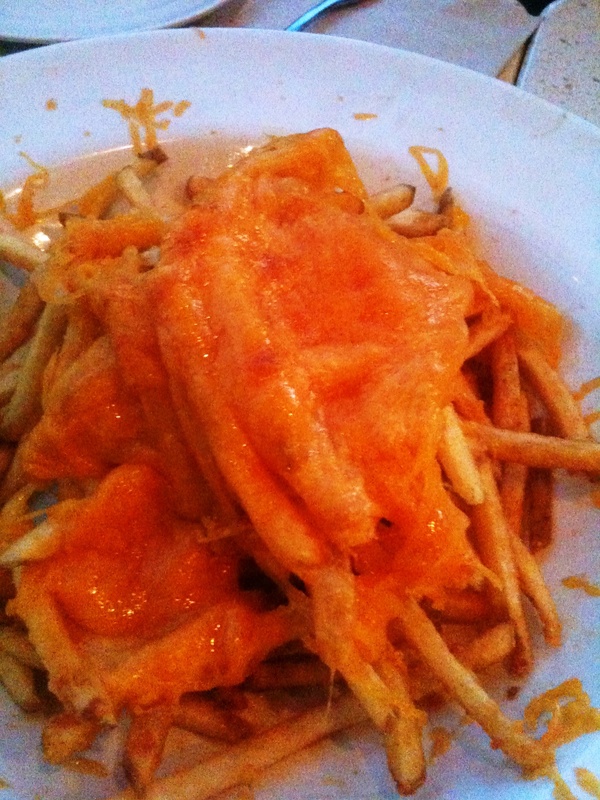 As an adult, though, I’ve moved on to more “gourmet” versions and higher quality ingredients…like -REAL- cheese…hahaha. I’ve been chasing the Grilled Cheese Truck around LA ever since I heard about it months ago. My first two attempts to partake in the ooey gooey yumminess were thwarted by crazy long lines. 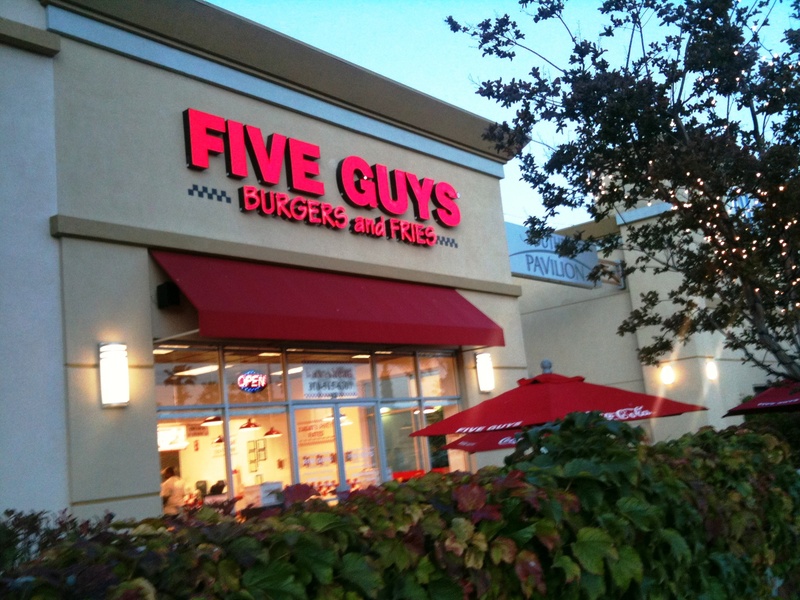 But when I read on Twitter that they would be at South Bay Mini in Torrance for some promotional event a couple of months ago, I told Husband that we were going and dammit, I was going to get me a GCS, even if I had to run people over (preferably in a shiny new Mini)! When we got there, there was already a line. Fortunately, it wasn’t anywhere as bad as the last two we encountered. 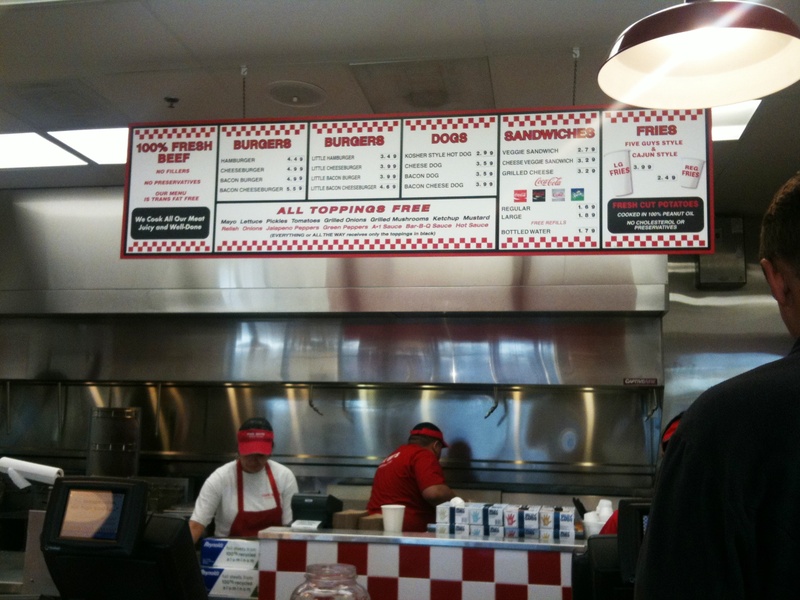 Sure, we still had to wait about 40 minutes before getting to the order window but I was on a mission. Even the threat of getting towed didn’t deter me; I just sent Husband to move the car instead…. Such a good spouse! 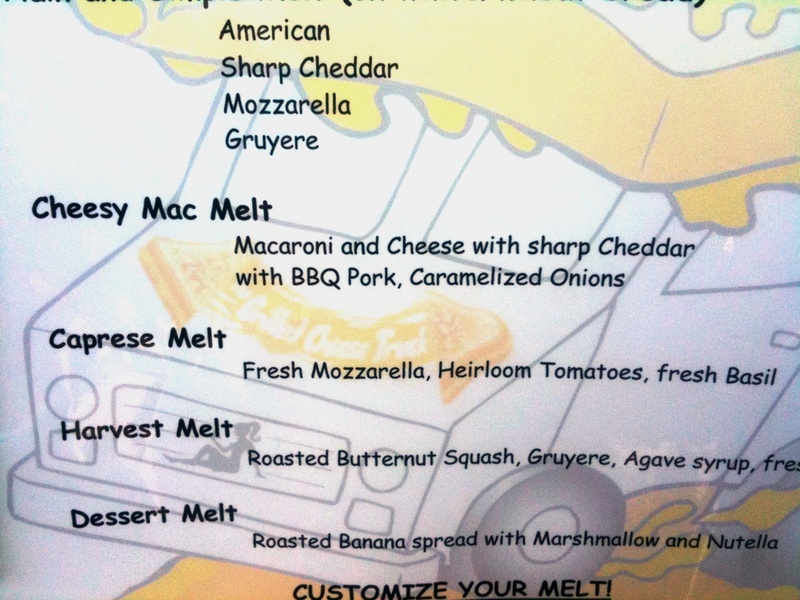 The Grilled Cheese Truck offers up several pre-made combinations and a list of ingredients for a build-your-own sandwich. 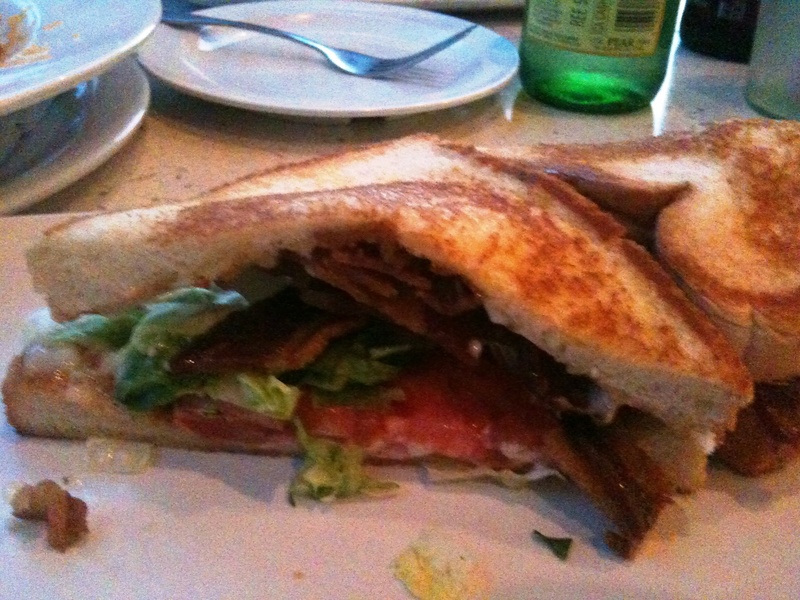 Bacon, cheddar, gruyere, basil, and tomatoes are just some of the choices you have. There’s also a “sweet” section for a dessert-y grilled sandwich – banana, nutella and marshmallow! I opted to add in the BBQ pork and caramelized onions. Husband went with the original Cheesy Mac Melt. I also got an order of the Harvest Melt. Hey, I didn’t know when I would get to visit the Grilled Cheese Truck again! Chipmunk??!?! Is that Grilled Cheese speak for chipotle? 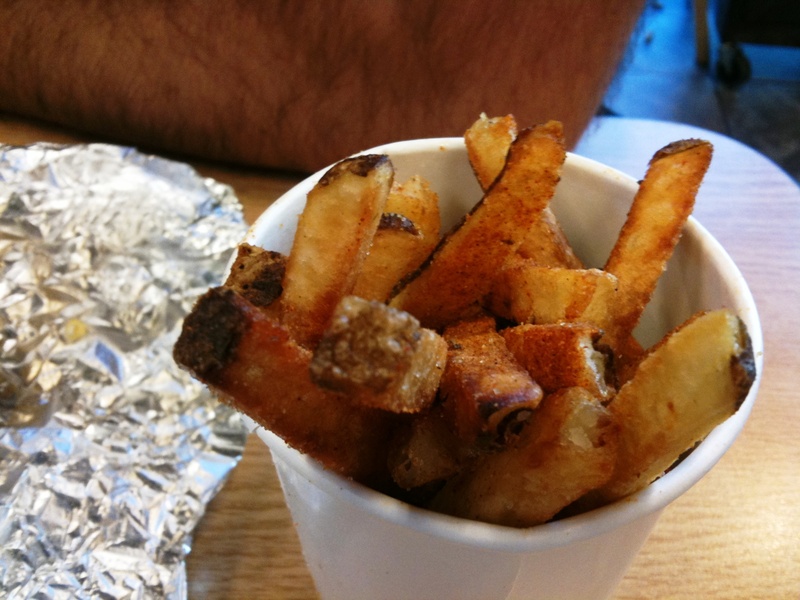 The Grilled Cheese Truck also serves up tater tots as a side and for 50 cents extra, you can get a dipping sauce. We got an order each and opted for the chipotle and nacho cheese sauces. Turns out, a single order of tots would have sufficed for the two of us. Not the best tots I’ve had, these were a bit on the greasy side and were a little soggy. The chipotle dip packed a bit of a kick but paired with oil-heavy tots and a heavy cheese sandwich, it was too rich for my stomach. 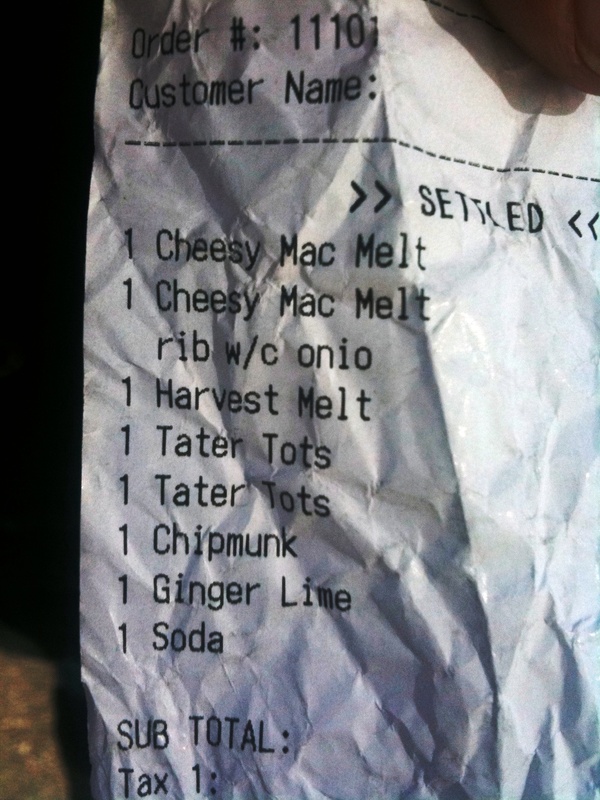 The nacho cheese dip was actually better and lighter. 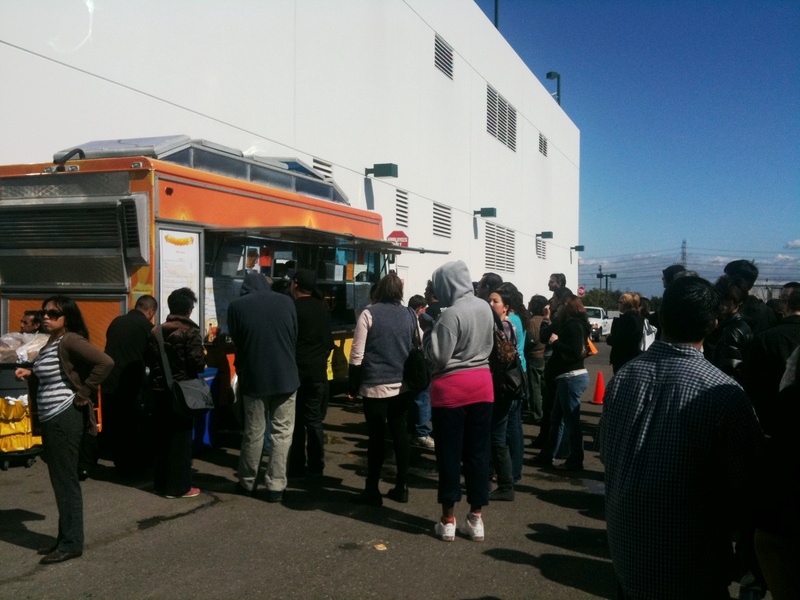 Last weekend, the Grilled Cheese Truck was back at South Bay Mini so Husband and I stopped on our way to the Del Amo Mall to indulge in some GCS goodness. This time, I tried their double-cream brie and pear with turkey while Husband went for the Cheesy Mac Melt again, but opted to add in bacon. 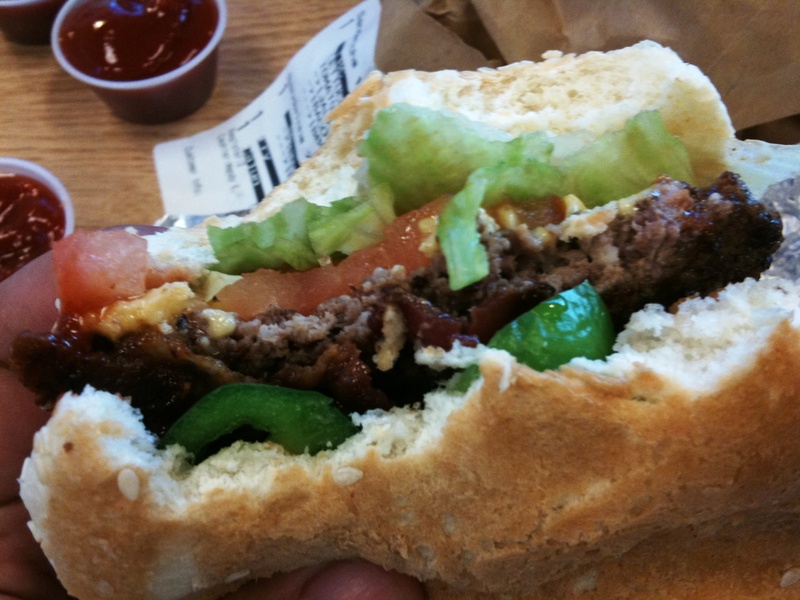 Last time, we both felt that the original needed some sort of meaty product to offset all the starch. 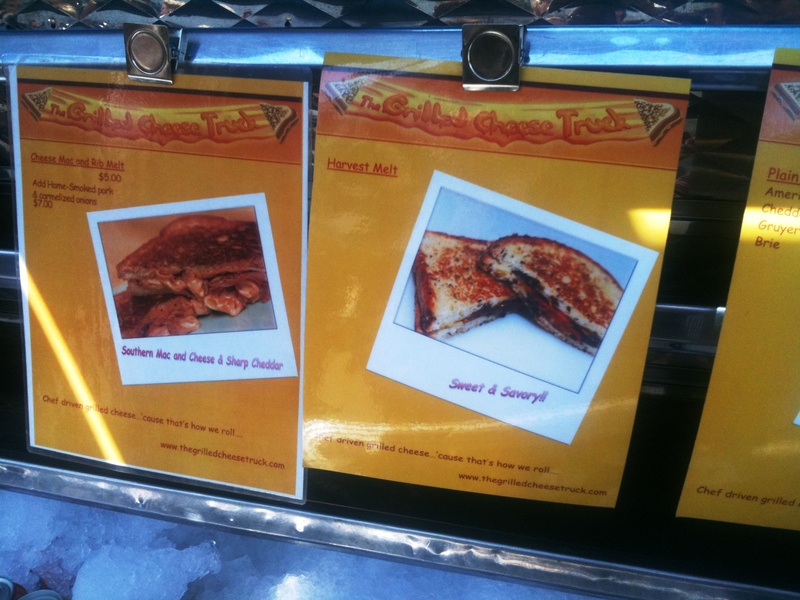 Price wise, Grilled Cheese Truck isn’t the cheapest; our 2nd time eating their food cost us $18. A bit high for a “food truck”, but the sandwiches are fancier with better restaurant-quality ingredients so I don’t be-grudge the hit on my wallet as much. 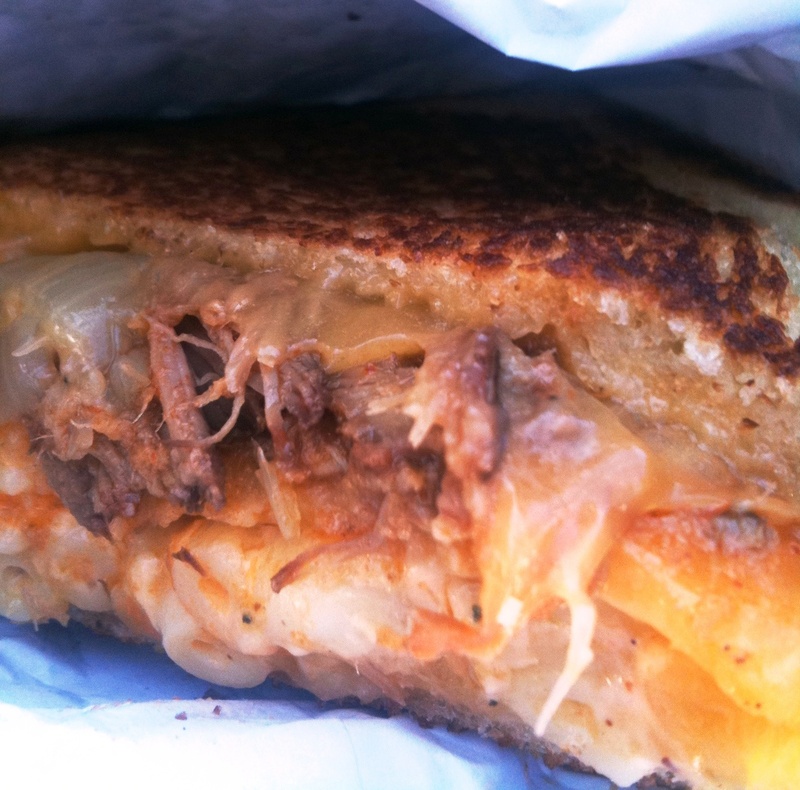 4 NOMs for Grilled Cheese Truck! 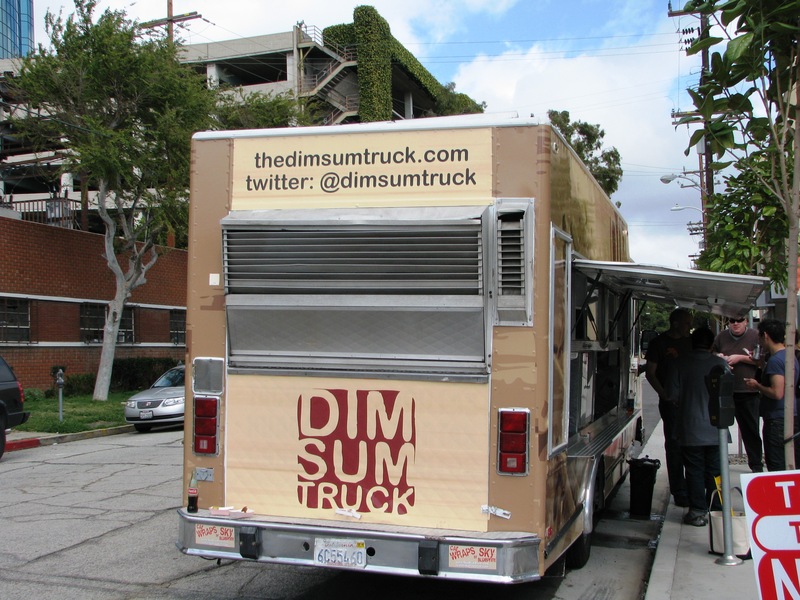 Sunday, the Husband and I were invited to attend a sneak peek of Los Angeles’s newest food truck, Dim Sum Truck! I had tried a couple of their items at the Food Fest and liked them, so I was looking forward to tasting more of their menu. 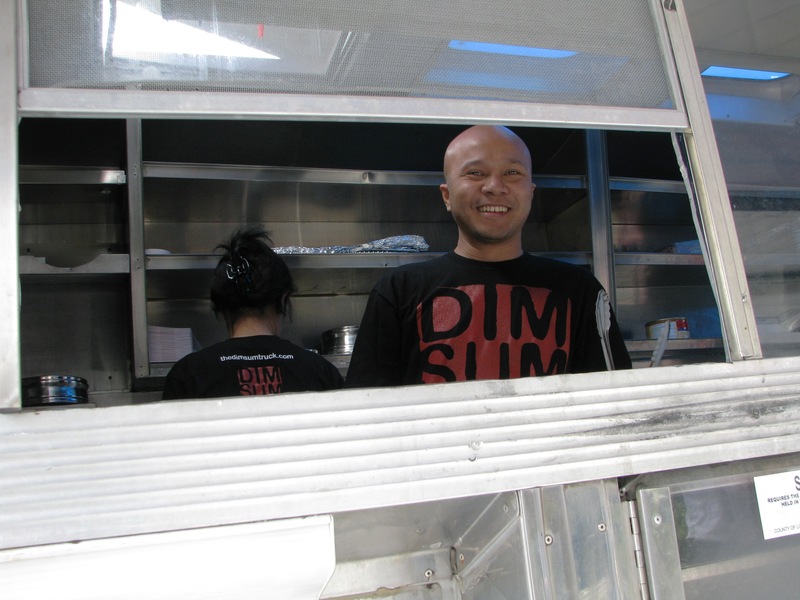 Founded by Alex Chu, a young entrepreneur and graduate of USC, the Dim Sum Truck seeks to bring this classic Chinese cuisine to the streets of Los Angeles. Those familiar with the food scene in this city know in order to get the “good stuff” when it comes to dim sum, one has to trek all the way to the San Gabriel Valley. Not an easy thing for those who live on the west side, like me. When we got to the truck, there was already a small crowd. Not a problem as Alex and his crew already had food ready to go. 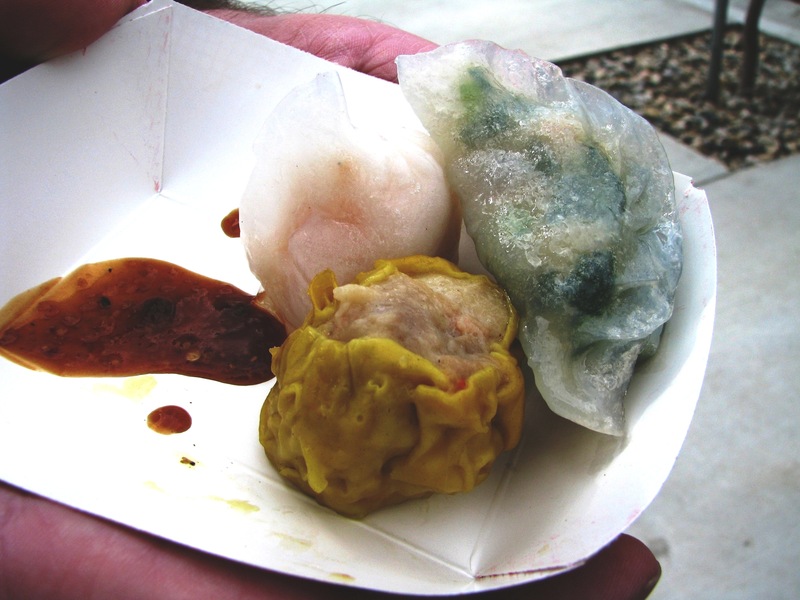 First up were dumplings – har gow, shu mai and shrimp n’ chive. Right off the bat, I noticed that these pieces were a little bigger than what I was used to getting at the restaurants. The taste of each was on par with what you get at the restaurants, too, though. Not a surprise given that Mr. Chu started his food career at a dim sum restaurant…. The sauce served with the trio of dumplings was salty and garlicky but lacking in the heat for me. I didn’t mind because it complimented the flavors very well. 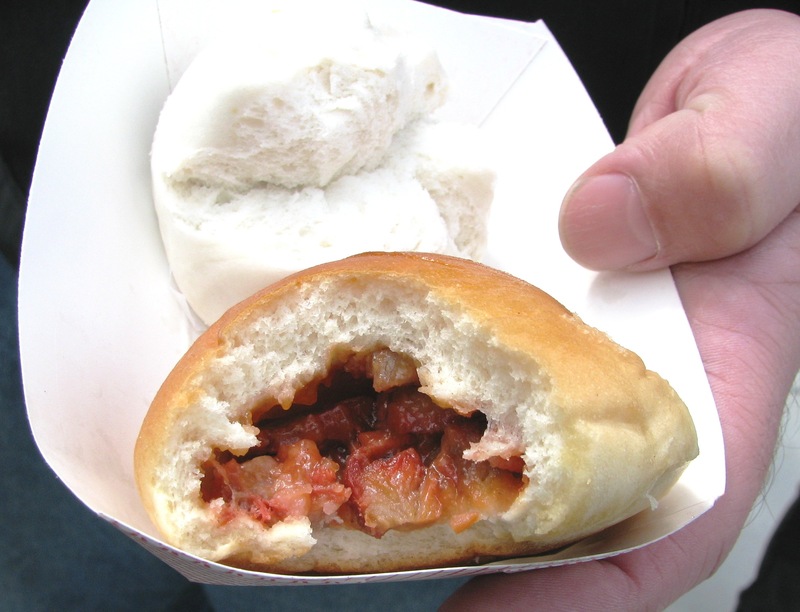 Next up was a duo of buns – a steamed bao filled with ginger and chicken and a baked bbq pork bun. I tried the bbq pork first. 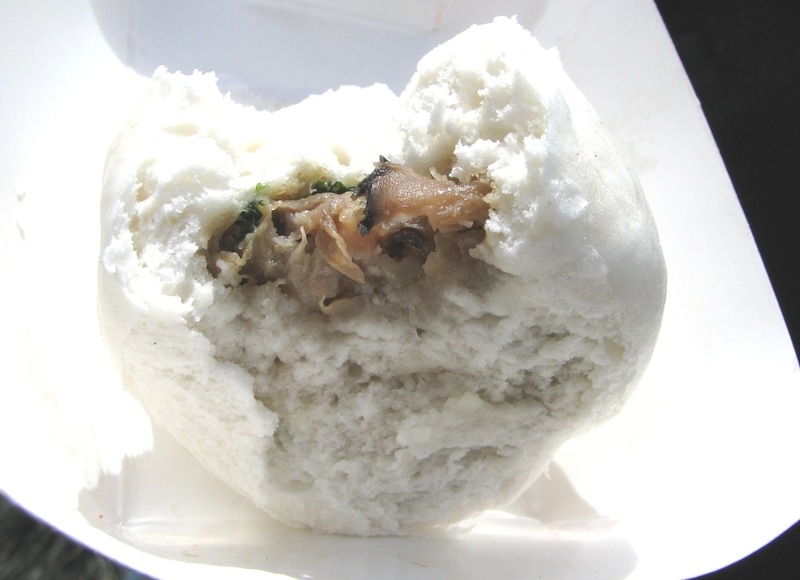 Stuffed with familiar sweet porkiness, this bun was quite good, though personally, I prefer the steamed version better because I like the texture and flavor of the steamed bread more. I thought the bao was going to also be filled with bbq pork since char siu bao is a classic dim sum dish, so I was surprised when I tasted chicken and ginger. The flavors were really good; I loved the ginger. But it was a little skinny in terms of the filling as you can see. 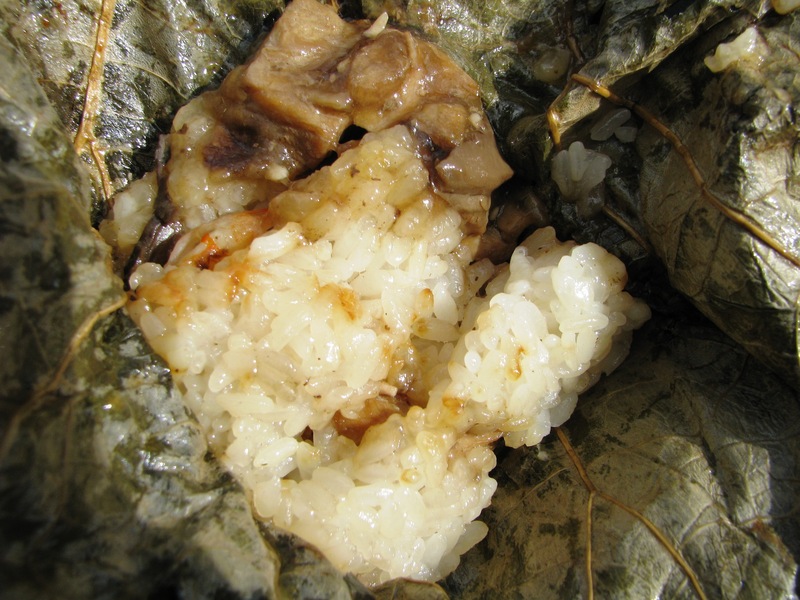 Dim Sum Truck was also serving up zongzi, a dish consisting of sticky rice with various fillings steamed in lotus leaves. This version had pork, chinese sausage and mushrooms. There was a nice earthy flavor infused into each bite from the leaves. The pork was a little dry, though. I did love the one piece of chinese sausage, juicy and intense. 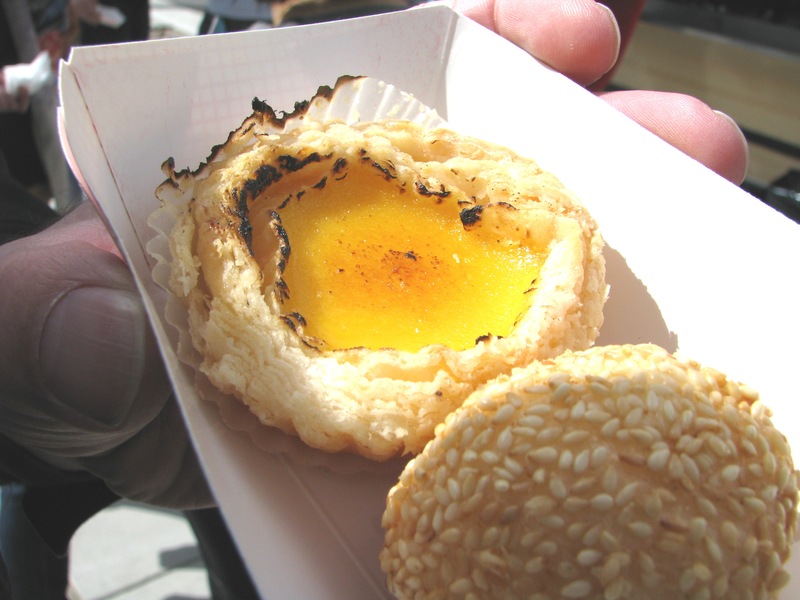 For dessert, there were egg custard tarts and lotus paste-filled sesame balls. To caramelize the top of the tart, Alex broke out the kitchen torch. The filling was smooth and perfect but the crust was not as flaky as I would like; it was a little soggy. I’m used to the sesame balls being filled with a red bean paste. The lotus version was a little less sweet but it was still good. 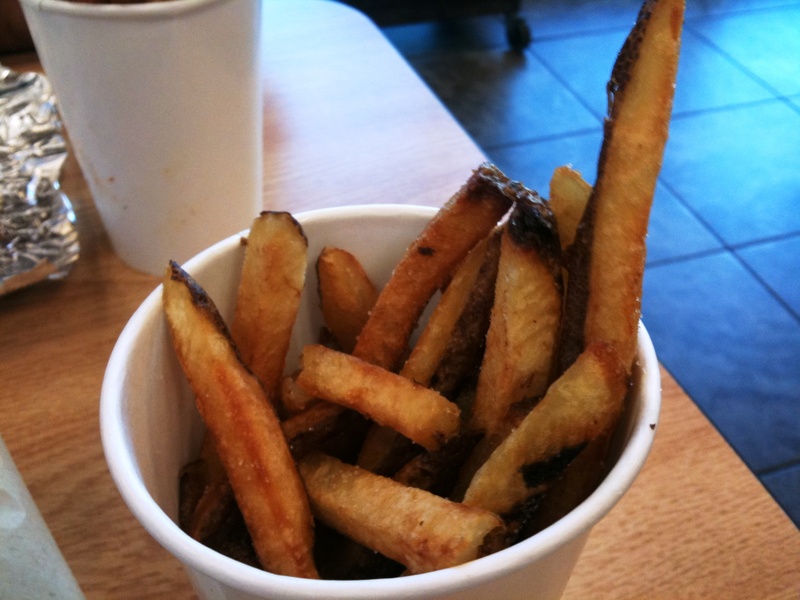 The shell was not oil-saturated and had just the right amount of chew to it. 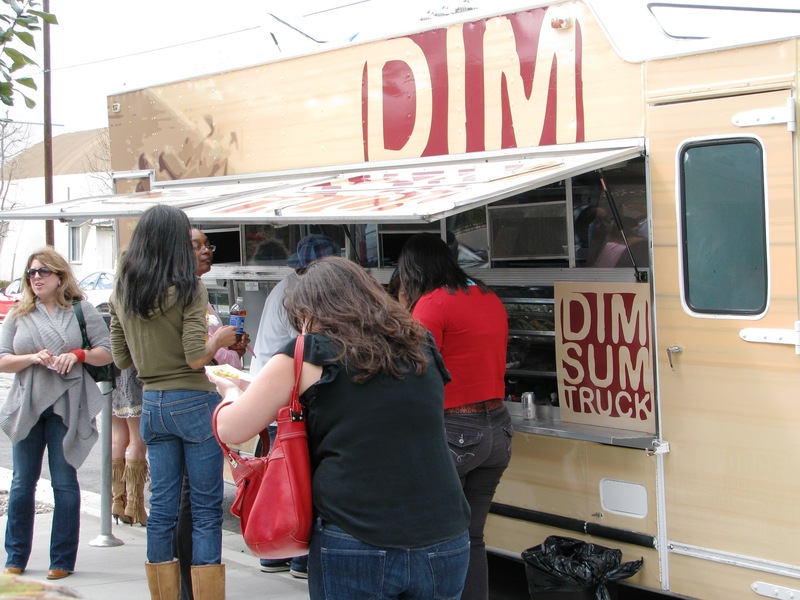 Based on their website, Dim Sum Truck will also be offering up dim sum-Mexican fusion dishes like a roast duck taco, which I tried at the Food Fest (yum yum yum), and a spicy tofu mulita. All in all, this was some good eats and I give them 4 NOMs! 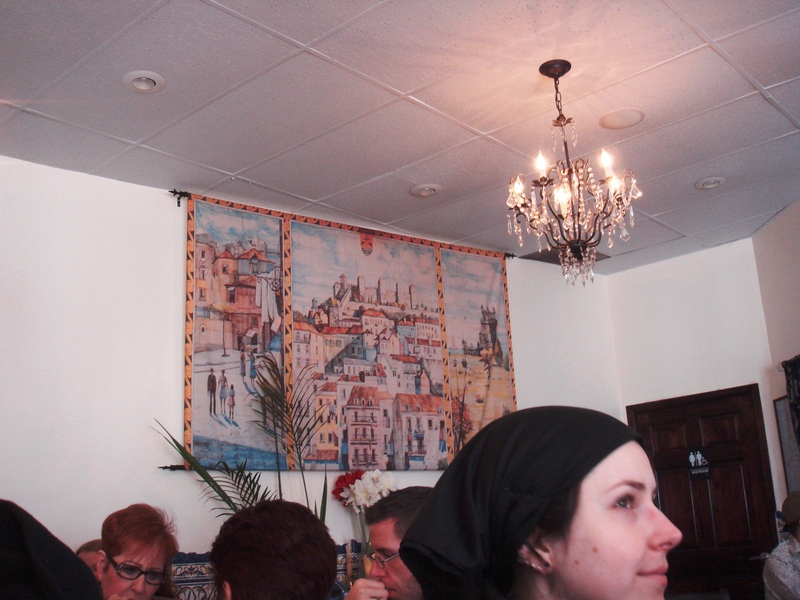 The same weekend we visited Portugal Imports, we also ventured into the valley to try Natas Pastries. Tanya Bjork, artist extraordinaire, found out about this place from her mother and researched it. The bakery was founded almost 5 years ago by Fatima Marques who was homesick for her native pastries. Not finding a single place in Los Angeles that offered pasteis de nata (also called “natas”), she spent years studying how to reproduce these delectable desserts the authentic, old-fashioned way and went so far as to import an oven from Portugal. 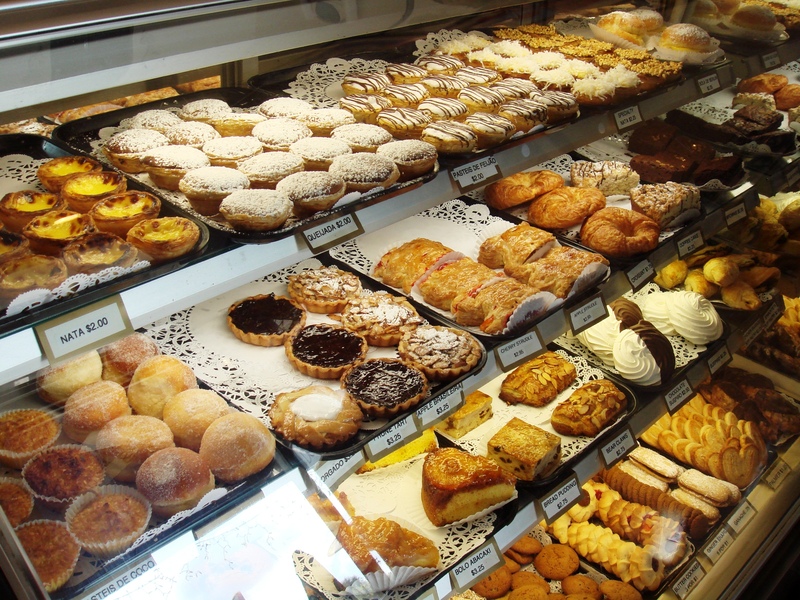 Besides offering traditional favorites like queijadas (tarts filled with a mixture of cheese, sugar, cinammon), pasteis de coco and Portuguese sweet bread (similar to Hawaiian sweet bread), Natas Pastries also offers other European desserts like eclairs and Napoleans. 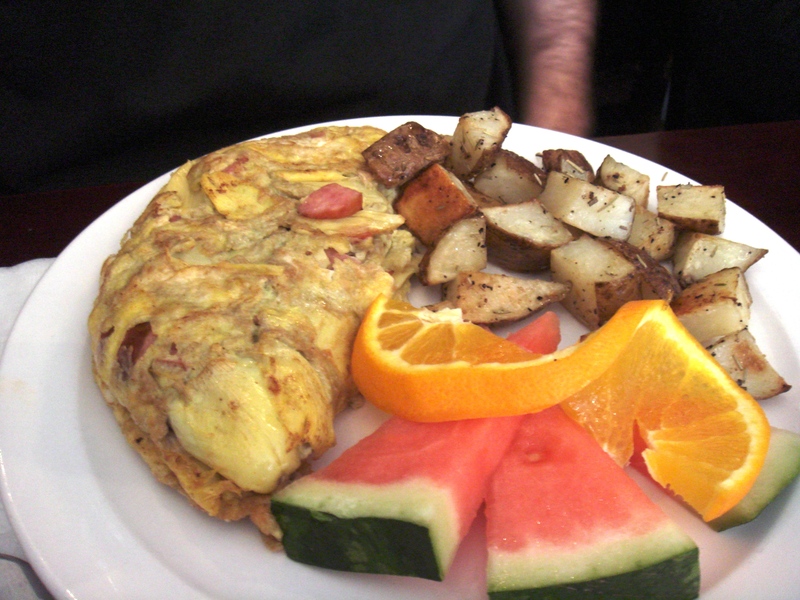 It is also a small restaurant that serves breakfast, lunch and dinner. Tanya and I decided to do Sunday brunch here and dragged our significant others. 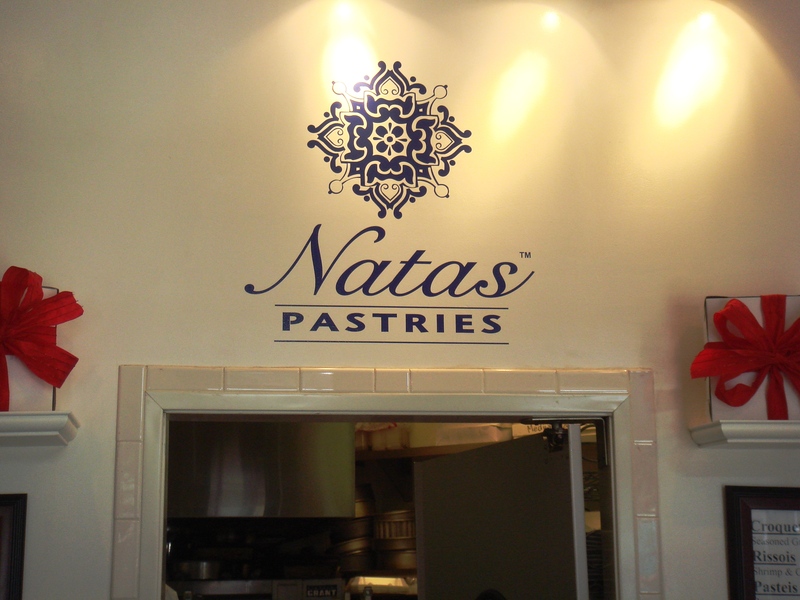 Natas Pastries is a small space divided up into two areas – a dining room furnished with about 8 tables for 4 and the bakery front. There are a few tables and chairs outside as well. 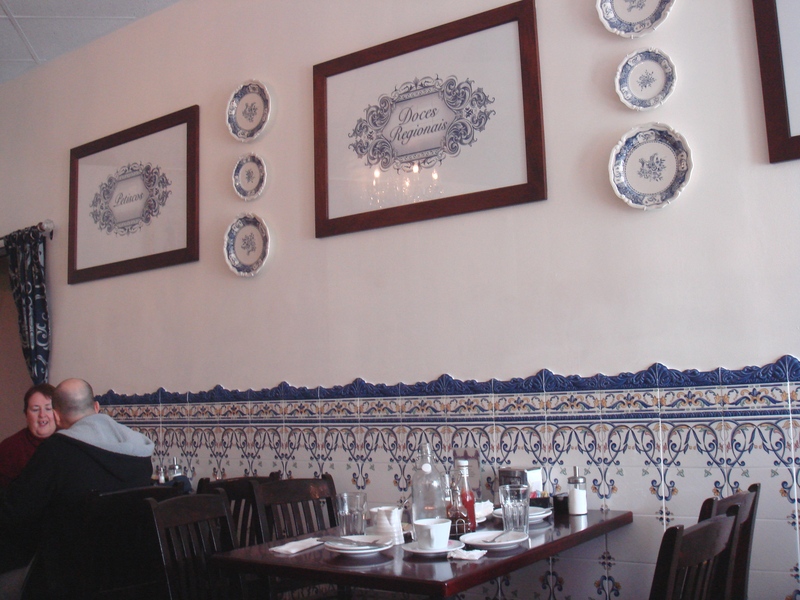 Inspired by the Portuguese style of using of blue and white glazed tiles, the dining room incorporates this aesthetic and accents it with dark wood furniture and tapestries reminiscent of Old Europe. It was nice because it really did remind me of places I had seen when in Lisbon. When we got there, the dining room was full as were the few tables outside. People were going in and out of the door with boxes in hand. Apparently, Natas Pastries is popular. We had to wait around 15 minutes to be seated. This gave us plenty of time to oogle the pastries on display and decide what we were going to get on our way out. After our group was seated, we perused the menu and decided our meals. 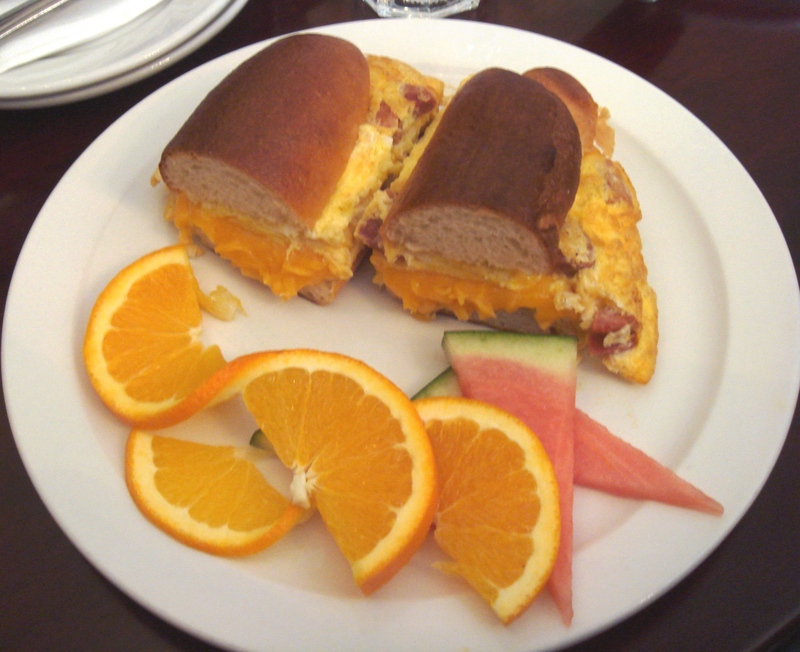 I got the breakfast sandwich on Portuguese sweet bread with cheddar and linguica. 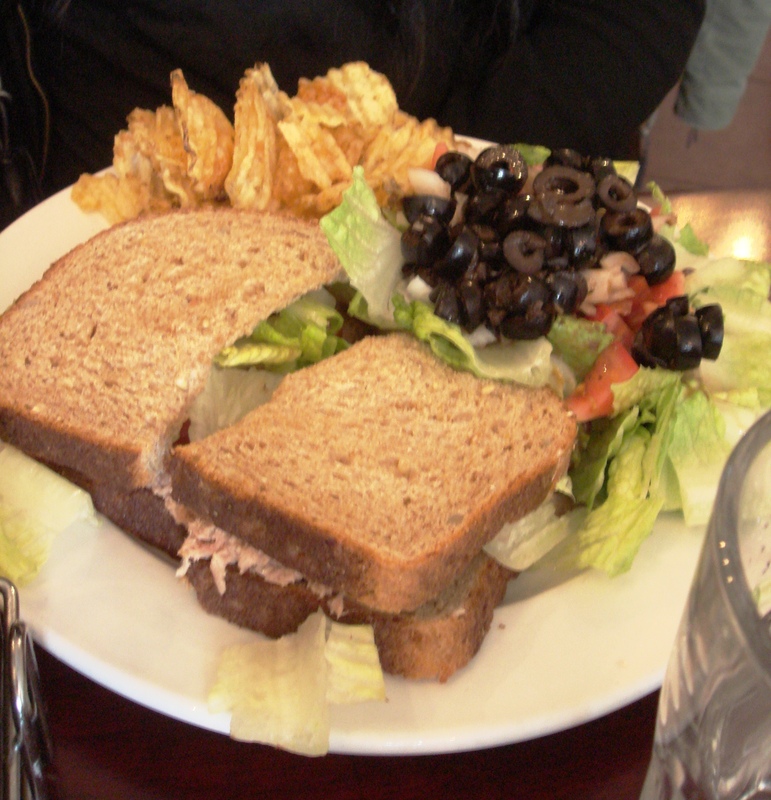 Tanya opted for the Sandes de Atum (Portuguese tuna salad sandwich). Husband got the chocolate chip and Oreo cookies pancakes and Tanya’s boyfriend, Derek, got an omelette with artichokes, Cajun smoked sausage and feta. I liked my breakfast sandwich. The eggs were fluffy and not over-cooked. There was plenty of cheese and linguica. I wish the linguica was spicy but a bottle of hot sauce solved that issue. 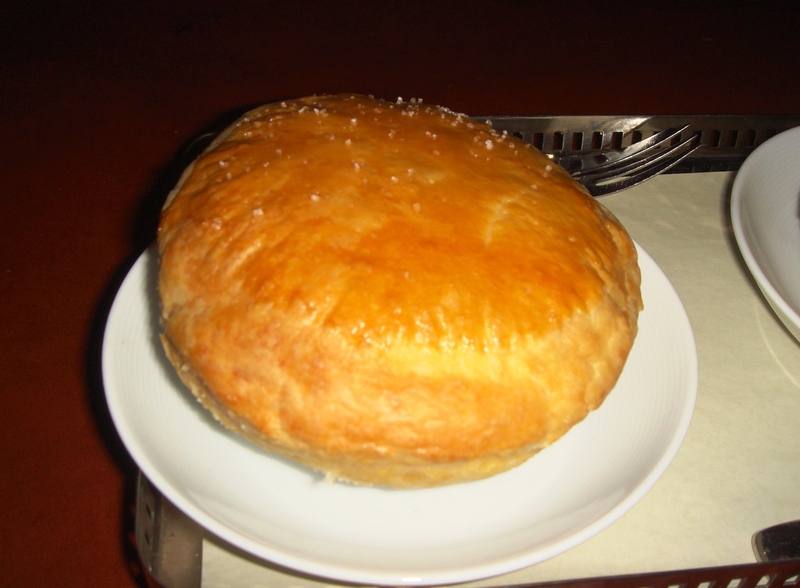 The in-house Portuguese sweet bread was great – soft and thick. The rolls do look thick but with the amount of egg and cheese, it all balanced out. And the subtle sweetness of the bread added a little bit of contrast with the salty fillings. Husband’s pancakes were quite a plateful. I’m not sure if this counts as breakfast or dessert. 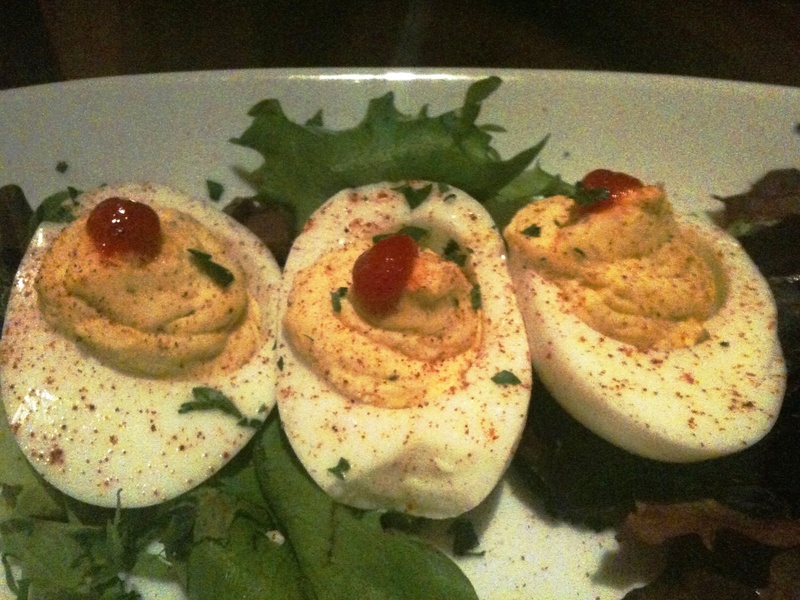 Frankly, when this dish arrived, my teeth started hurting. 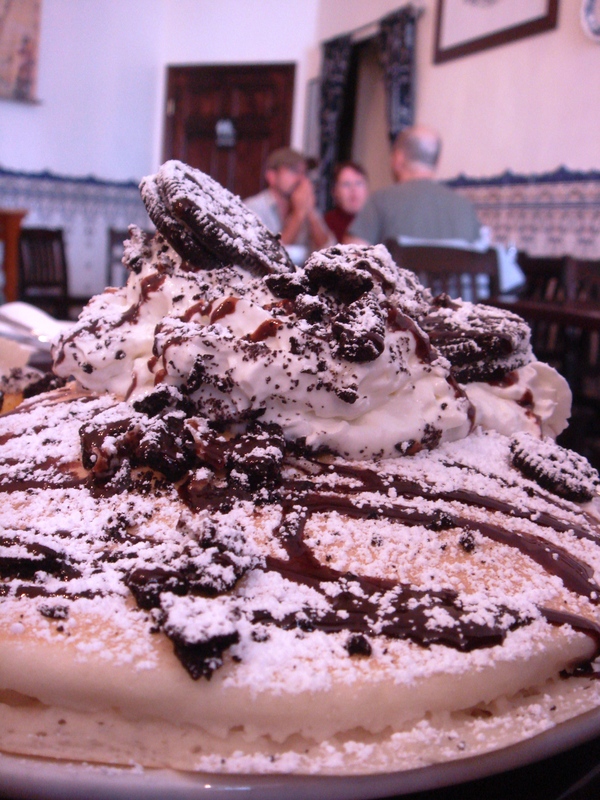 3 ginormous (yes, I had to resort to a made-up word) pancakes topped with powdered sugar, whipped cream, chocolate syrup and crumbled Oreo cookies sat before Husband. Definitely not Portuguese… He had filled up on the mocha he ordered to drink so the husband barely put a dent into this. I stole a few bites; the pancakes were thick and fluffy and definitely sweet with all the dessert-y toppings and syrup added. Not a dish for me as I’m not a fan of over-the-top sugary stuff but for kids or people with a penchant for dessert, this is a winner. I’d order just the pancakes, though. Tanya and Derek liked their food though Derek did comment that the ingredients he picked out made for a bit of an odd combination flavor-wise. Tanya claims that the imported canned Portuguese tuna used in the sandwich is more flavorful than the tuna we get here in the States. I haven’t done a taste comparison so I can’t concur but she has had both quite a few times so I defer to her. 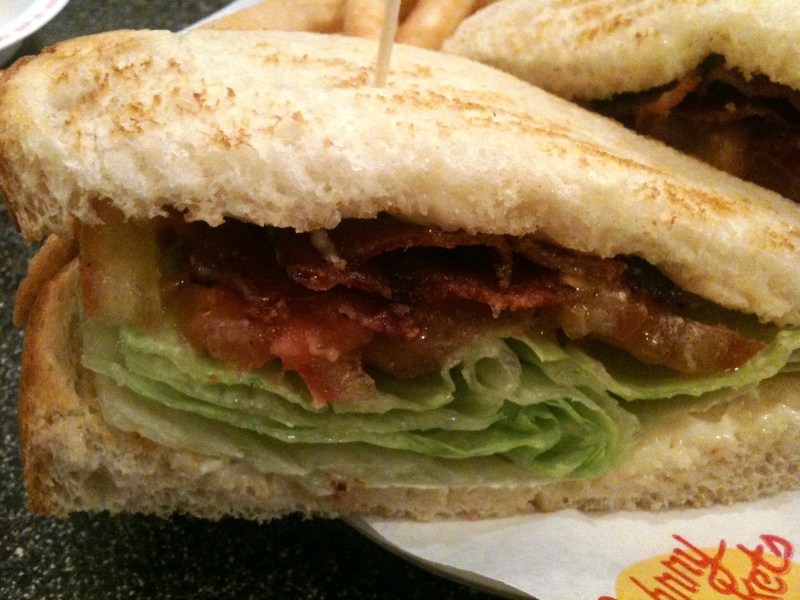 This sandwich is part of the lunch menu. Served with a side salad and kettle chips, it was a large and filling-looking dish. Selection is something Natas Pastries is not lacking. 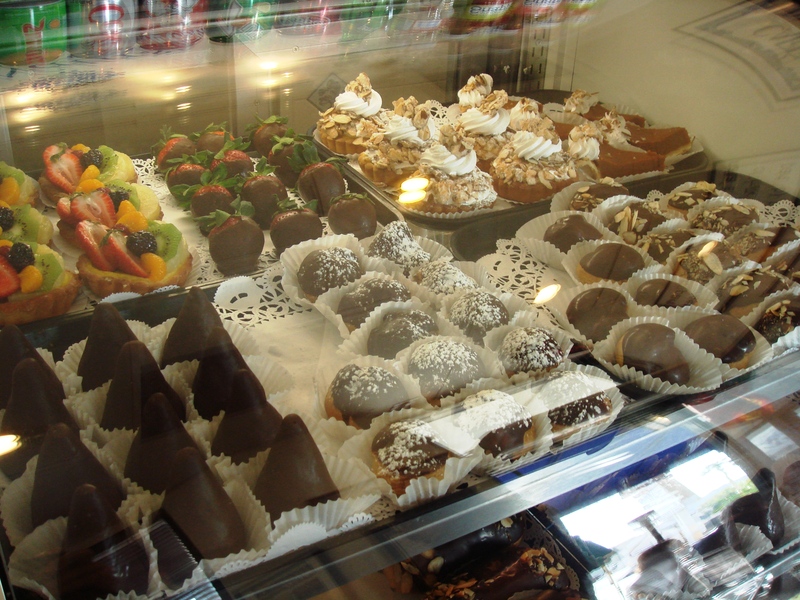 Natas, queijadas, pasteis de coco, pasteis de feijão (bean tart), fruit tarts, chocolate covered strawberries, slices of various flavors of cakes, meringue cookies, this place is a dessert lover’s paradise. And everything, including the sweet bread they use, is made in-house. For those who have never tried Portuguese pastries before, the variety box is a great way to go – 9 pieces for $16. I decided to get this since I have only tried natas. I selected 3 natas, 3 queijadas and 3 pasteis de feijão. The natas here were really good. 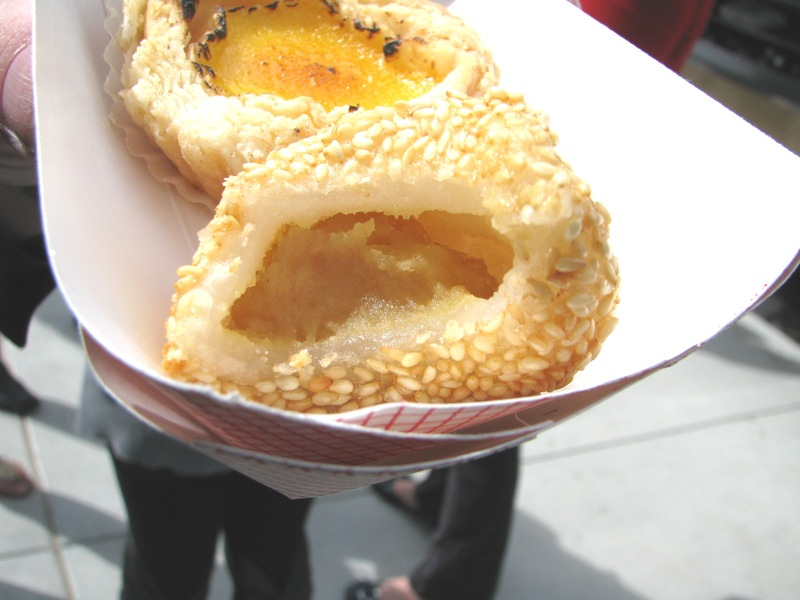 The crust was flaky and buttery while the filling was a nice custard-y texture. It was better than the nata I had during my trip to Belém, though I did get that nata from some shop cafe and it had been sitting out for a while. The queijadas were also tasty but the powdered sugar topping made it a little messy. The cheese-cinammon-sugar filling was yummy without being very sweet. Again, they make a very good pastry crust here. The bean tart was also good but the natas were my fave followed by the queijadas. Overall, this was a great little bakery and restaurant. I will definitely be back for the tasty desserts. After all, it’s a lot closer and cheaper to go to Natas Pastries than go all the way back to Lisbon. 4 NOMs for Natas Pastries! A few weeks ago, Dine LA hosted its Spring Restaurant Week (well, actually 2 weeks). This is a prime opportunity to sample some of Los Angeles’s fine dining restaurants without breaking the wallet. My friends, Kristeen (proprietor of Kristeen LaBrot Events) and Suzy, accompanied me to XIV. We’ve talked about this place for a while now and were finally lured in by the offer of a $44 prix fixe 3-course dinner menu. XIV, owned by Michael Mina, is pretty much what you’d expect a hip LA fine-dining establishment to be – posh decor, a large bar serving unique cocktails, fashionable patrons and, of course, the occasional sighting of a celebrity or three. Oh yeah, can’t forget the looooong wait for a table, either, despite having a reservation. We waited over 40 minutes to be seated. The host did comp us a round of drinks for the inconvenience, though. Suzy, who is warming a bun in the oven, was quickly accommodated with delicious mocktails. 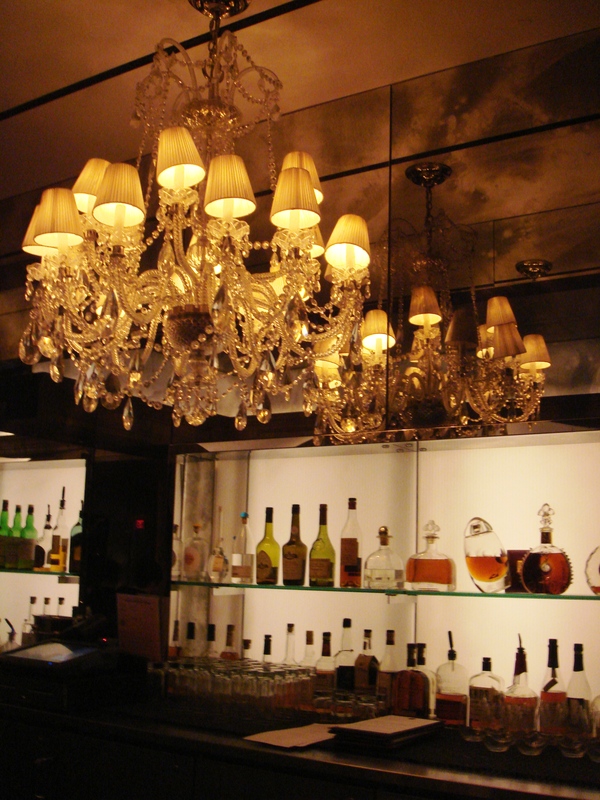 The saying “you get what you pay for” holds true for XIV…impeccable service on all fronts. When we perused the regular menu, the debate began as to whether we should stick to the Restaurant Week menu or splurge and order one of the tasting menus. XIV offers 3 levels – 8 courses for $64, 11 courses for $88, and 14 courses for $112. For those not familiar with what a tasting menu is, the table selects a number of choices from the menu and each person is served a sample portion (usually around 2-3 bites) of that dish. It is a great way to sample a variety of the restaurant’s offerings but the entire table is required to agree on what the choices are. While not really a problem for smaller groups, for larger ones, getting consensus could be like herding cats since the menu has a lot of delicious options. XIV does accommodate vegetarians and vegans as well. We decided to splurge and went with the 8 course tasting menu. 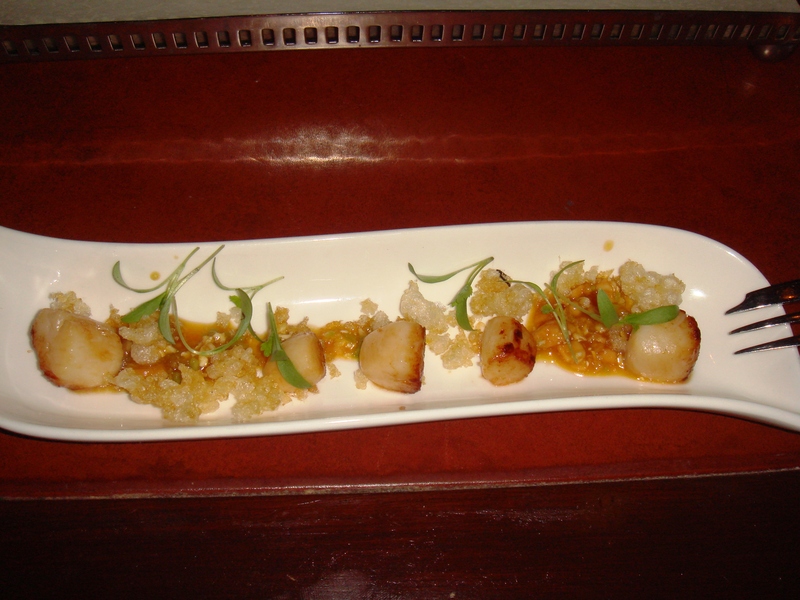 First up was the Nantucket Bay Scallop Tempura. I was expecting a large scallop that was tempura battered and fried. What I got was very different. Little baby scallops dotted the plate, garnished with fried tempura batter bits, cauliflower.. The flavor was delicious and the scallops perfectly cooked. The crunchy texture was a nice contrast to the butteriness of the scallops. Even Suzy, who is not a fan of scallops, liked this dish. Next on the appetizer list, the Ricotta Strozzapreti. 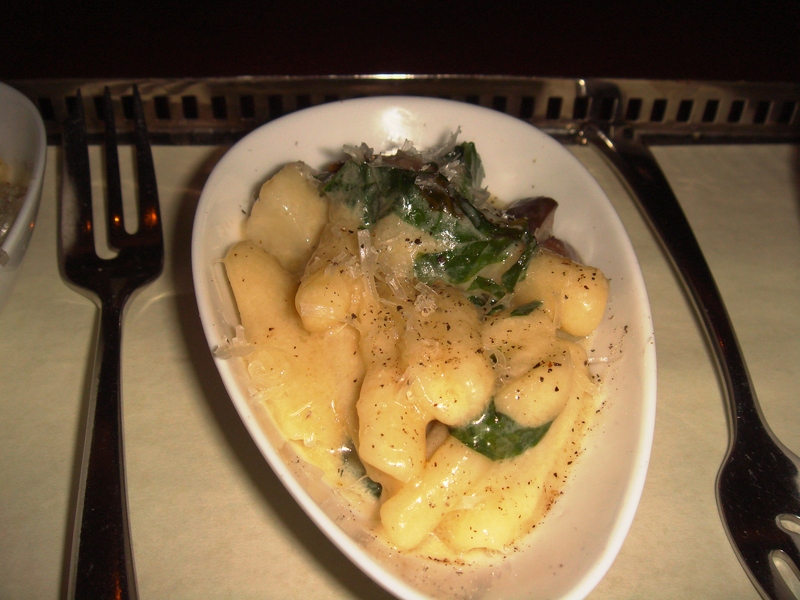 This is actually a pasta dish with a ricotta and pecorino cheese sauce, porcini mushrooms, turnip greens and sunchokes. This was one of the best dishes of the night, in my opinion. The flavor of the cheese was nicely balanced with the earthiness of the mushrooms and the greens added a much-needed burst of color. 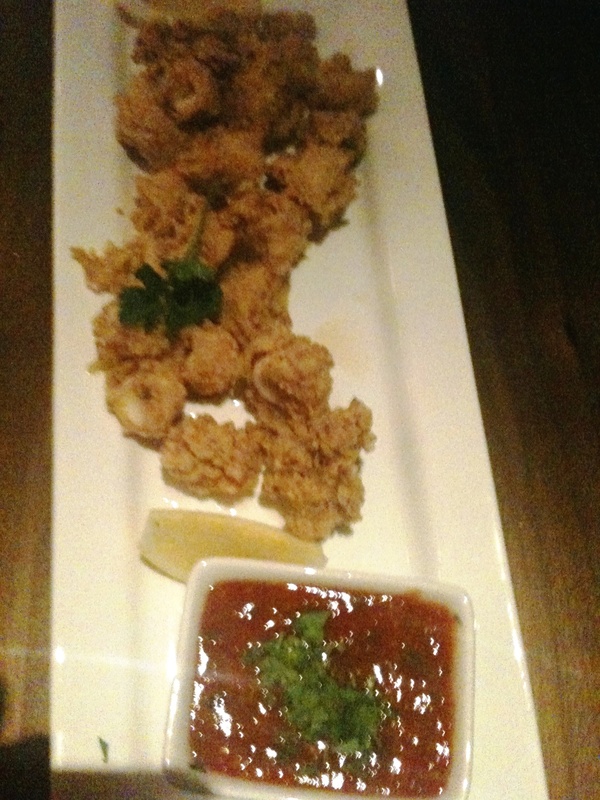 After tasting this, I was a little surprised that this is an appetizer; it seems a bit heavy and rich to be a starter. 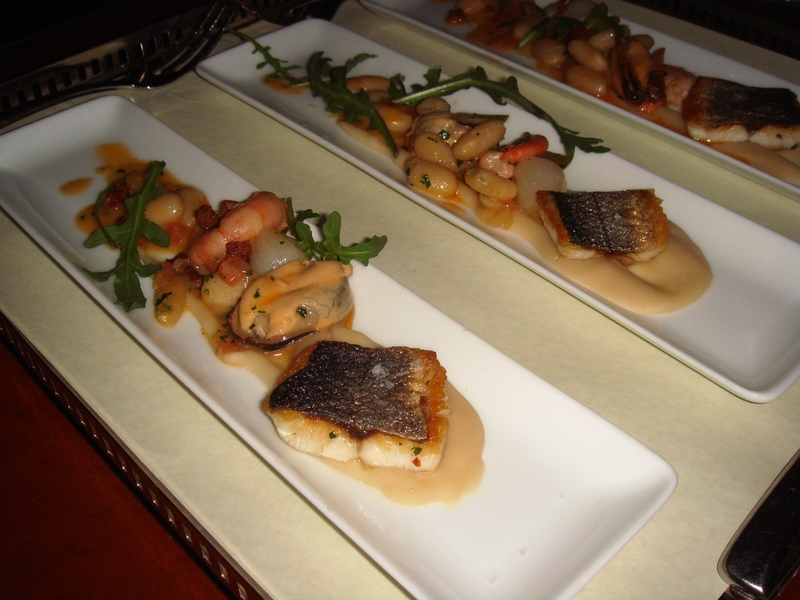 For our first main course sample, we chose the Crispy Branzino. The branzino (a type of sea bass found in Europe) was delicious. The skin was perfectly crisp, the meat moist and flaky. The butter bean puree that was served under the fish, I found bland even when combined with the other ingredients on the plate. The chorizo didn’t really come thru for me, either. 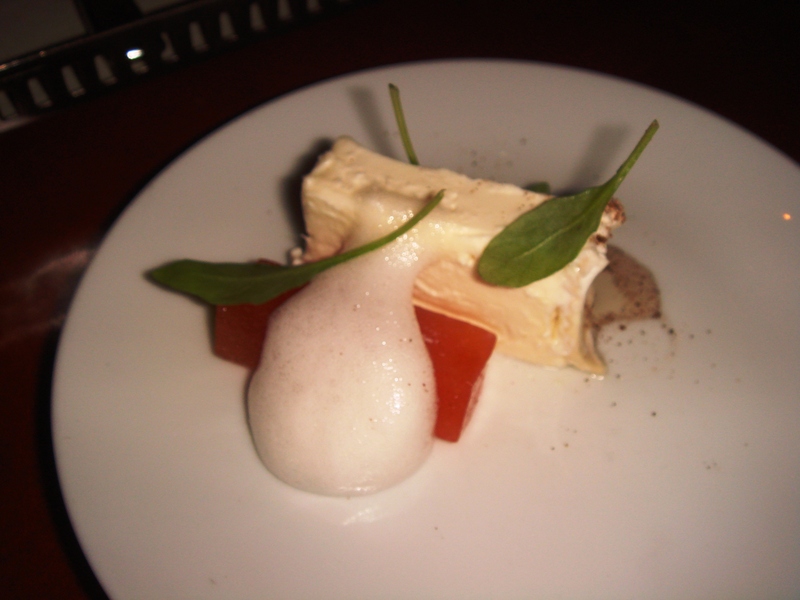 While the presentation was beautiful, taste-wise, this was the most disappointing dish of the night for me. 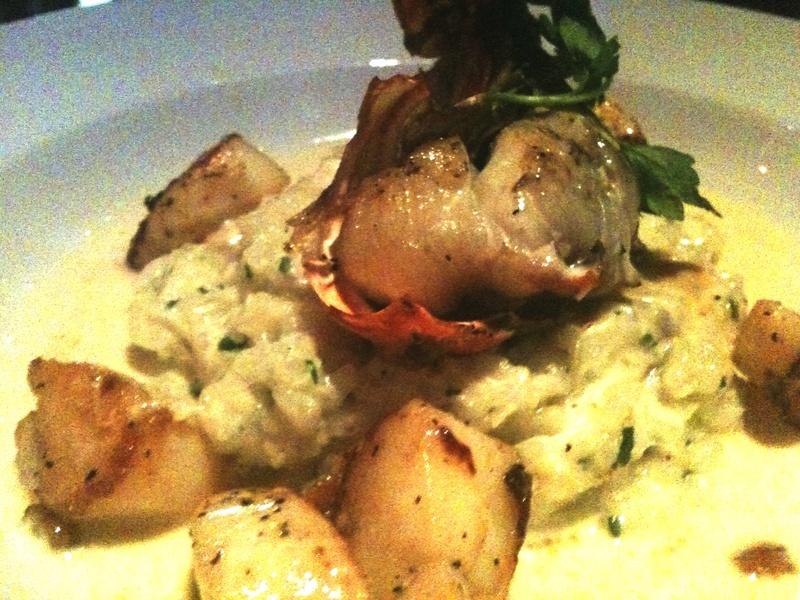 We selected the Maine Lobster Pot Pie which was next and came with an extra $15/pp charge. 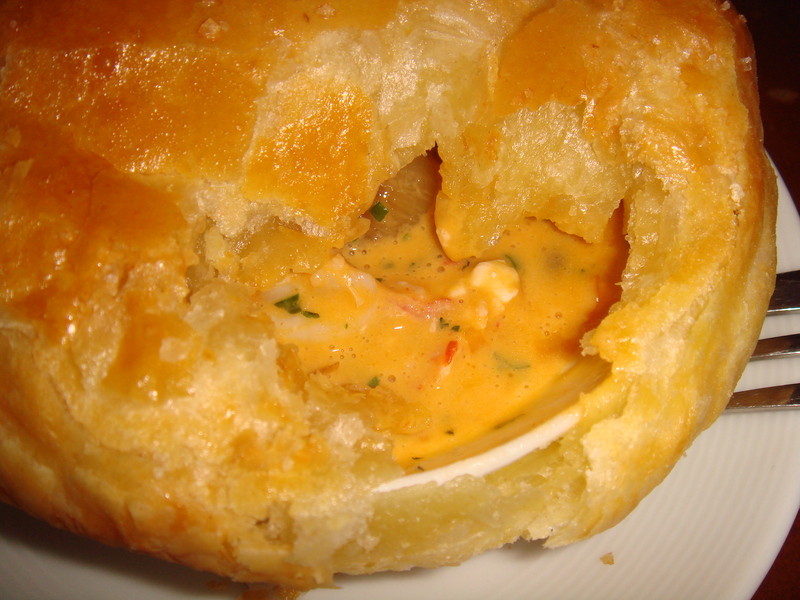 It was more like a lobster bisque covered with a puff pastry and definitely took more than 2-3 bites to eat. 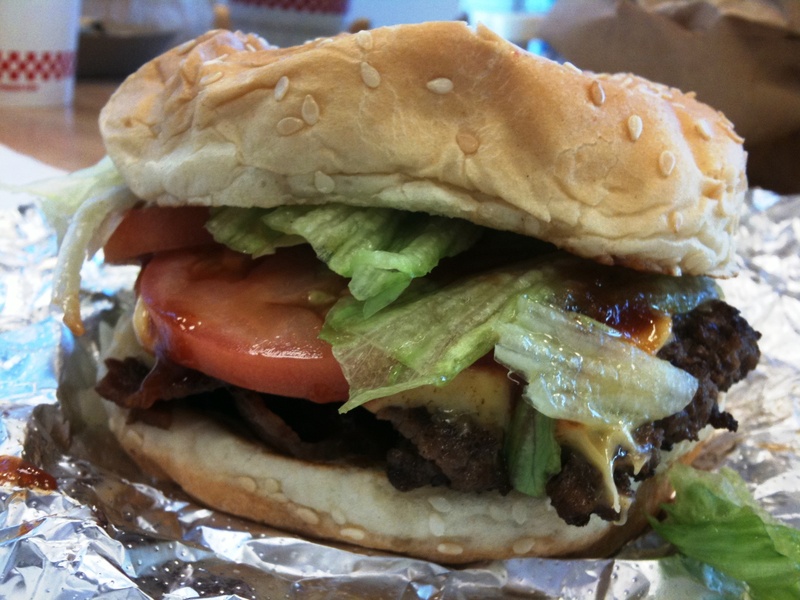 The “filling” had a creamy smooth texture and great flavor. The puff pastry was flaky and buttery. While I liked this dish best out of the 3 main courses we tried, I didn’t think it was on par with the Strozzapreti. The Prime N.Y. Steak arrived next. I really had high hopes for this dish. 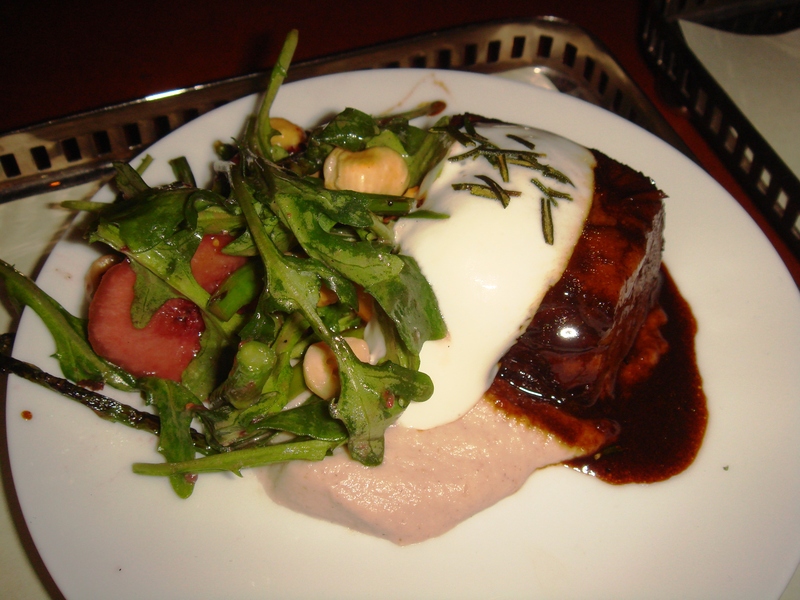 It had a list of ingredients that I love – Kobe short rib, arugula, hazelnut, figs, horseradish. The short rib, while fork tender, ended up being drowned out by the flavor of the sauce. The arugula salad with fig and hazelnut was good but nothing special. Overall, this was an okay dish but not outstanding as I hoped. The Nutella Custard followed and this was another superb desert. Topped with passionfruit foam, toast streusel and popcorn ice cream, the textures and flavors melded together to form delectable, decadent bites. A must order for Nutella fans, like me. 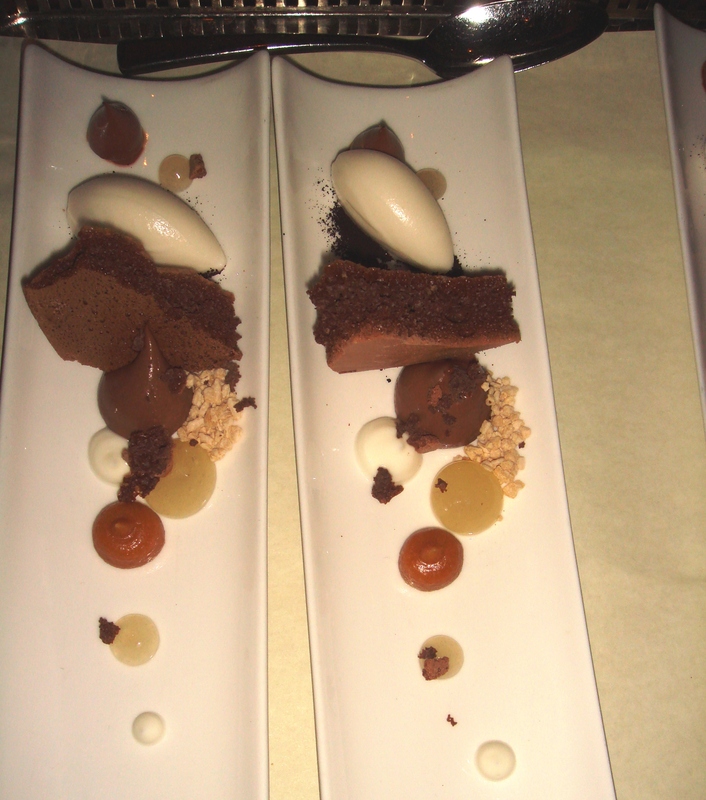 To end our meal, we had the Chocolate Cream dessert. It was not the dish I would have wanted to end my night on. 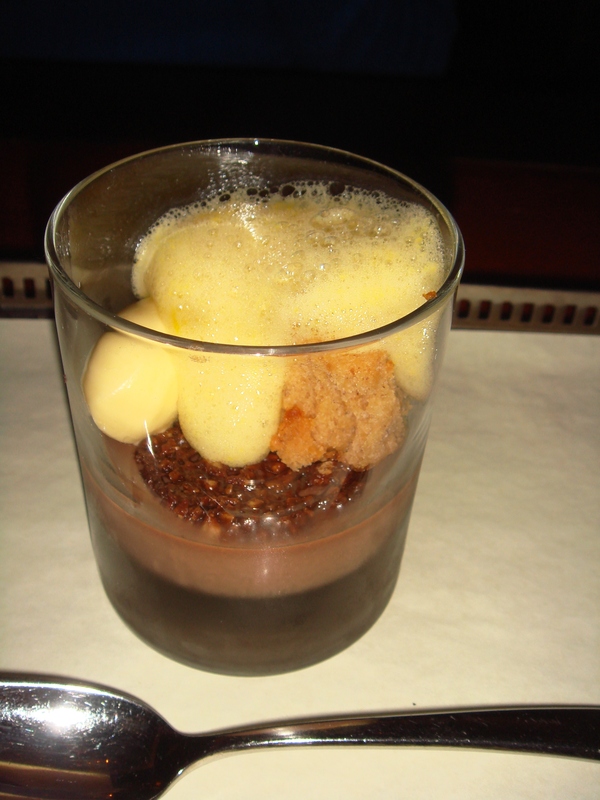 While it was a good chocolate dessert, it didn’t blow me away like the XIV cheese did or make me want to lick the dish like the Nutella custard did. I would have preferred to start the desserts with this as I thought it was the weakest one. Overall, XIV both impressed and disappointed my taste buds. 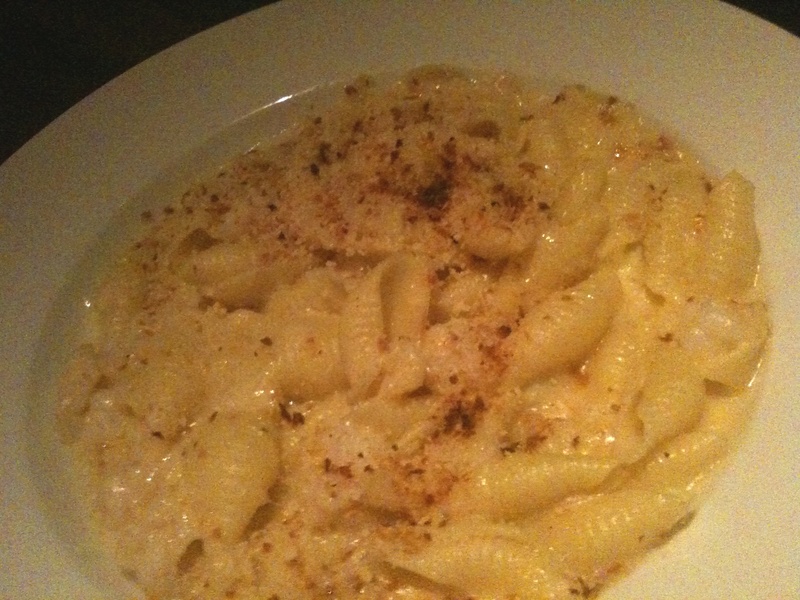 The selections we had from the main course section of the menu were nothing that would draw me back for the cost but the cheese and Strozzapreti were delicious enough that I would come back just to eat those dishes again. Fortunately, there’s still quite a few items left untasted on the menu to make another visit worthwhile. The Catty Critic gives XIV 4 NOMs.